I am a fan of films depicting doomsday. Fail-Safe and Dr. Strangelove are my favorites and I have both on DVD to watch whenever I feel like it. The World, the Flesh and the Devil is another doomsday film that I liked a lot, but have seldom seen. I saw it at a local drive-in theater when it was first released and I was 8-years-old way back in 1959. I saw it on television once, maybe twice, but that is all. As far as I can tell, the movie was never released on VHS or DVD. I'd love to see The World, the Flesh and the Devil again (and again)*. If anyone is aware of where I can get a copy of this film, I would appreciate it. * Being a techie even at age 8, I was fascinated with how they filmed this movie. 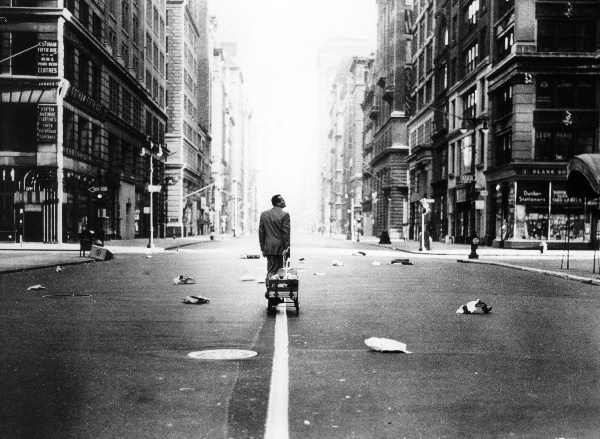 Most of the film takes place on the deserted streets of Manhattan. This was long before special effects could sweep clean the streets of people, so I imagine it must have been a logistic nightmare accomplishing the same effect without special effects. Hi. I understand you are looking for the movie The World, The Flesh And The Devil. I will be posting this movie to my Disaster Movie Site for download sometime tomorrow. I also have hundreds more disaster movies you may be interested in. Thanks.